Independence Day in Angola is celebrated on November 11. 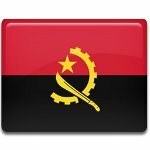 This national holiday commemorates Angola's independence from Portugal in 1975. The Portuguese first arrived in Angola in the late 15th century. In 1575, they founded Luanda, which is now the capital of Angola. Angola had been a Portuguese colony for 400 years, with the exception of a short period of Dutch occupation from 1641 to 1848. The armed struggle for Angolan independence began in 1961. It is known as the Portuguese Colonial War or the War of Liberation (in the former Portuguese colonies). The main protagonists in this struggle were the Popular Movement for the Liberation of Angola (MPLA), the National Front for the Liberation of Angola (FNLA), and National Union for the Total Independence of Angola (UNITA). In 1974, a military coup known as the Carnation Revolution took place in Portugal. The new government put an end to war by agreeing to recognize the independence of its colonies. On November 11, 1975, the MPLA took control of the capital city of Luanda and declared the independence of Angola. Angola's Independence Day is a public holiday widely celebrated throughout the country. It is marked with formal speeches, solemn ceremonies, parades, concerts and other festive events and activities.